Being an active participant on the Senate Governance and Finance Committee has prevented me from participating in the Capitol’s annual frog jumping contest, sponsored by Senator Tom Berryhill. This year, the Committee concluded before 11:30 a.m. and my frog, “Fiscal Frogality,” placed second! This is big news and the My Mother Lode provides it in the first piece below. The OC Register‘s lead editorial gives a shout out to SB 590 and our efforts to address the school district reserve cap. It also appears in sister publications, like the LA Daily News. This morning the Governor released his May Revise Budget and commented on how it was important that locally elected school boards ran their budgets. Well, Governor, it doesn’t help when Sacramento dictates that there be caps. The editorial does an excellent job of providing the history and is the second piece below (also see MOORLACH UPDATE — Snubbing — May 10, 2017 may 10, 2017 john moorlach). I try my best to stay out of the OC WEEKLY, he said in jest. But I made it to the lead article, which details the recent activities of young Republicans at Orange Coast College and the University of California Irvine. It mentions my recent bill, SB 677, and provides its perspectives (also see MOORLACH UPDATE — Whistleblower Protection Prevented — April 26, 2017 april 26, 2017 john moorlach and MOORLACH UPDATE — Senate Bill 677 — April 6, 2017 april 6, 2017 john moorlach). The lengthy history is provided in the third piece below. SB 764 and SB 671 made it to this morning’s Session Floor agenda, but due to a technical problem with CalChannel’s broadcasting, the Session was cut short. This provided me with a few minutes to meet with members of the media to discuss the Governor’s May Revise. More on that tomorrow. Sacramento, CA — While none of the Sac Town frog jockeys came close to breaking Rosie the Ribiter’s legendary 21 feet, five and three-quarters inches jump, the 43rd annual Capitol Frog Jump provided a hopping good time under sunny skies. Hosted earlier today by Mother Lode lawmaker Senator Tom Berryhill at the State Capitol grounds, the event continues to serve as a humorous, unofficial herald to the Calaveras County Fair and Jumping Frog Jubilee, which this year runs from May 18 to the 21 at Frogtown in Angels Camp. Assemblymember Frank Bigelow served as the master of ceremonies for the event, whose nonamphibious participants included a mix of elected officials, legislative staffers and members of the public. This year’s winner of the Longest Jump trophy went to Assemblyman Kevin Kiley and his frog “Frog the Bounty Hunter,” which managed a 12-foot, one inch jump. The Shortest Jump was awarded to Assemblyman Jim Frazier and his frog “Leroy Green,” whose jump measured two feet, nine-and-a-half inches. To view a video clip of the festivities provided by Sen. Berryhill’s office, click here. By now it should be self-evident that teachers unions in California operate in the interests of the unions, not the children their teachers are responsible for educating. A union-backed rule that severely limits school reserves is a perfect example of this. In 2014, a provision was slipped into a budget trailer bill, Senate Bill 858, that would limit school reserves if the state makes a deposit — even a very small one — into the state school reserve fund created by the Proposition 2 rainy-day fund, approved later that year by voters. 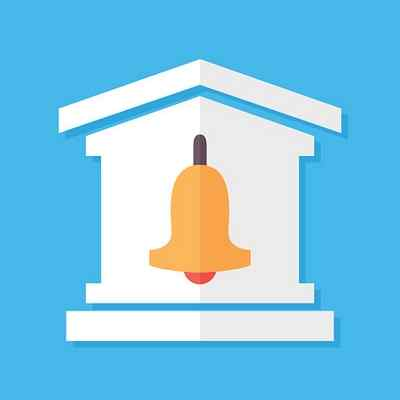 What, you might ask, would be the purpose of tying school districts’ fiscal hands, putting them at greater risk during economic downturns, reducing their credit ratings, driving up borrowing costs and encouraging greater use of expensive bond financing? It makes perfect sense to the teachers unions, who stand to be in a much stronger position to negotiate compensation increases if school districts are forced by the cap to spend down their reserves or allocate less money to emergency repairs, infrastructure improvements, instructional programs and the like. A January 2015 Legislative Analyst’s Office recommended eliminating the reserve cap, and noted that the median reserve for midsize school districts in the state was 21 percent of expenditures, yet, under SB 858, their reserves would be capped at just 6 percent. Furthermore, the caps were smaller than the reserve levels of more than 90 percent of public schools in the state. But it is not just fiscal conservatives who are pushing for reform. Democratic Sens. Jerry Hill of San Mateo and Steve Glazer of Orinda have introduced a bill, SB 715, which would increase the cap from 6 percent to 17 percent and exempt small and basic aid school districts from the requirements. In a positive sign, SB 715 passed the Senate on a unanimous 38-0 vote on Monday, and now heads to the Assembly. In addition, Democratic State Superintendent of Public Instruction Tom Torlakson noted during a budget hearing earlier this year that he opposed the cap, and in June 2015, 26 Democratic members of the Assembly and Senate sent a letter to legislative leaders to express support for modifying the cap in the interest of fiscal soundness. Yet, even in the face of such significant bipartisan support, the teachers unions have thus far been able to exert their influence to scuttle multiple reform efforts. Let us hope that the Legislature and Gov. Jerry Brown will finally put the fiscal and educational interests of students, school districts and taxpayers ahead of the special interests of the teachers unions by eliminating, or at least significantly increasing, the school reserve cap. On the other side of the grassy quad stood freshman Caleb O’Neil. Blond and fit, with a strong jaw and a helmet of hair that gave him the look of a Kennedy cousin, he held his own sign: “Be Careful What You Wish For, Olga! We’re Standing Up!” He had secretly recorded Cox on his cellphone, then shared the video with OCC’s College Republicans chapter. The club put it up on YouTube, and it quickly went viral—and led to the school suspending O’Neil. Right-wingers rallied around him nationwide; locally, young conservatives sprung into action. More than 20 fellow College Republicans joined O’Neil for the protest. Standing with them were older men in suits, including Republican Assemblyman Matthew Harper (R-Huntington Beach) and Shawn Steel, the former chairman of the California Republican Party and husband to Orange County Supervisor Michelle Steel. Nothing eventful happened on either side during the rally. But in just showing up to protest, OC’s various conservative student groups, from College Republicans to Young Americans for Freedom and more, can claim victory. 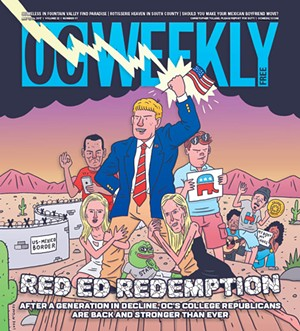 In retreat for nearly 20 years as OC became more liberal and the California GOP cratered, the rise of Trump has inspired millennial conservatives to come out on campus. Their actions get national coverage, thanks to smart social media and an alt-right press who claim a liberal conspiracy in higher education and are thrilled undergrads are standing up to it. College Republicans were there during the March 25 #MAGAMarch at Bolsa Chica State Beach, and graduates jeered during Cal State Fullerton’s commencement, when Univision anchor María Elena Salinas spoke in Spanish and trashed Trump. Last September, Young Americans for Freedom members caught Saddleback College history professor Margot Lovett removing “9/11 Never Forget” posters with images of the Twin Towers from a wall. Former Breitbart News senior editor Milo Yiannopoulos spoke at UC Irvine last June and October, which led to protests against him, sanctions against the College Republicans that the university eventually had to walk back, and a permanent ban on Yiannopoulos speaking there. And in February, a “No Ban, No Wall” protest against Trump’s immigration policies at Cal State Fullerton ended in a physical altercation between anthropology professor Eric Canin and a CSUF Republicans member, for which the instructor was suspended. But as Rowlands and her fellow travelers become rising stars in their movement, their progressive peers express concern. “It’s just like [College Republicans] can intimidate, and they can troll, and they’re going to do whatever they want until something very bad happens,” says an anonymous OCC student who feels college administrators haven’t done enough to protect students from conservatives on campus. During the OC GOP’s golden era, its youth wing had a consistent presence on all county campuses. During the 1980s, College Republicans at Santa Ana College (then known as Rancho Santiago College) hosted Nicaraguan exiles opposed to the Sandinistas; the Chapman University branch welcomed Oliver North when he spoke there in 1993. The movement continually brought new blood to the local GOP, and many became elected officials themselves. Longtime OC GOP head Tom Fuentes was a College Republican at Chapman; other GOP bigwigs such as Scott Baugh and Van Tran were involved in Young Americans for Freedom. The trend continued somewhat into the 2000s, such as when UCI’s College Republicans held a bake sale in 2004 mocking affirmative action, or when the same chapter displayed controversial cartoons featuring the Prophet Muhammad in 2006; both actions made national news. But after Barack Obama was elected president in 2008, College Republicans clubs across the county mostly faded away as millennials turned to the Left. Campus progressives fear them so much that, earlier this year, a rumor spread that the College Republicans were going to build a fake border wall on campus. Faculty and activists planned protests, even though Rowlands said they weren’t actually planning on doing something like that. But Rowlands is unapologetic about the “loud and out-there activism” of her club. The College Republicans represent a silent minority of students who are “very appreciative that there’s somebody out there voicing their beliefs and not really caring about the Leftists that call them names or try to shut them down,” she says. The former business major, now political science major hopes to continue to dismantle the “liberal monopoly on academia” in her current run for state chair of the California College Republicans (CCR). She has even assembled a team called Rebuild CCR because she thinks the current organization is too focused on national politics instead of changing campus culture. On her slate is current OCC College Republicans president Vincent Wetzel, a self-proclaimed gay Hispanic Republican. Like Rowlands, Boyle says established local conservatives such as longtime Cal State Fullerton donor and alumnus Steve Mihaylo (after whom the university’s Mihaylo College of Business and Economics is named) have expressed their support for CSUF Republicans. Mihaylo recently drew heat after he trashed a Cal State Fullerton student on Twitter by asking him if he “ever considered getting a job” to pay off his student debt; the student replied by saying he already works two jobs on campus. College Republicans insist they’re the oppressed minority on college campuses across Orange County and that progressives make student life intolerable for conservatives. But a different story emerges from progressive students and faculty, who’ve been caught off-guard by the resurgent Right. “Milo Yiannopoulos wrote an article on his blog in support of the Republican Club here, and that really scares me because they’re connected to people who are known to put private, sensitive information out there for people to get doxed,” says an OCC student who asked to remain anonymous for fear of retaliation from College Republicans. The unannounced visits began in February, according to OCC progressives, while O’Neil celebrated his victorious appeal against the Coast Community College District Board of Trustees. They had originally decided to punish him with a two-semester suspension and force him to issue a personal apology to Cox and write a three-page essay about his actions. He defended his motives in a previous press conference. “I pulled my phone out because I was honestly scared that I would have repercussions with my grades because she knew I was a Trump supporter,” says O’Neil, who ended up getting an A in Cox’s course. In the weeks after the OCC College Republicans released the video, a student says faculty members with “ethnic-sounding” last names received threatening emails that warned them to stop supporting a “white genocide.” That led to a student writing to OCC president Dennis Harkins, begging for support. “[OCC’s College Republicans] have such wealthy lawyers they have the Republican Party funding them,” says yet another anonymous faculty member. “They’re being groomed and coached, and what they’re doing is waiting for someone to kick them out. They’re testing the college’s policies so they can sue the college for being biased toward conservative students. Adult OC conservatives have looked on with pride at their young wards and have offered to help when needed. KABC-AM 790 morning host John Phillips wrote for the Orange County Register‘s opinion pages that “OCC doesn’t deserve the support or confidence of the taxpayers who fund its indoctrination camp.” Recalde-Martinez has worked for Harper and Supervisor Andrew Do, and now works for Michelle Steele as an executive aide. Last December, California OC GOP royalty such as chairman Fred Whitaker and nine California elected leaders, including state senators Janet Nguyen and John Moorlach, sent a letter to Harkins discouraging disciplinary action against O’Neil. Later that month, Moorlach introduced a bill that aimed to provide whistleblower safeguards to college students. The proposed legislation sought to allow students to record in a community college classroom without an instructor’s permission if the students “reasonably believed” they were capturing a violation of local, state or federal laws. The legislation died in the committee because of a lack of support in the super-majority Democratic California Senate. Unions representing teachers and faculty claimed the bill would allow students to record as a weapon against teachers they simply don’t like or agree with. —–” on the hood of a campus-safety vehicle. And a “Black Lives Matter” art installation was mysteriously removed from the Arts Center building around that time. The OCC Republicans condemned the latter two events on its Facebook page. But then Cox was given a Faculty of the Year award in March by the Orange Coast College Professional Development Committee, which consists of faculty members, classified staff and past recipients of the award. The college GOP soon posted a meme on its Facebook page with a photo of Cox that read, “CALLS TRUMP’S ELECTION AN ACT OF TERROR/WINS TEACHER OF THE YEAR.” That led to a contentious April 5 Coast Community College District (CCCD) Board of Trustees meeting, at which Recalde-Martinez, Rowlands and others demanded that Cox’s award be rescinded. A facilitator at the Board of Trustees meeting had to remind audience members to compose themselves and refrain from interrupting speakers. When any speaker voiced opposition to the College Republicans, jeers burst from the crowd. But when the College Republicans spoke, none was interrupted by the audience. “The faculty has decided to make Olga Perez ‘un’ Stable Cox Faculty Member of the Year; this is completely inexcusable,” said Wetzel. He then called out Rob Schneiderman, president of the Coast Federation of Educators and consistent Cox supporter, for showing his “disreputable face here today” and warned his club will do everything to stop him from beating Congresswoman Mimi Walters in 2018. “We met her on the video!” interrupted a woman, which sparked laughs and applause by College Republicans supporters in the audience. This time, the conservatives in the crowd remained silent. Denise De La Cruz is a writer and the Clubs Editor for OC Weekly. When she’s not listening to music, she’s on the hunt for cool clothes, sappy films and Xxtra Flamin’ Hot Cheetos.